I think most of us know this as the Federal Reserve Building, or, where the Dorrance is. The landmark Union Trust Co. building downtown has been sold to the development group that produced the Providence G complex, with plans to convert its offices to apartments. The building, at 170 Westminster St., includes The Dorrance restaurant on the ground floor. The restaurant will remain, and a second floor converted to commercial space. The remaining 10 floors of the mid-rise building will be renovated over five years into rental apartments, according to Brendan Moran, property manager for both the Providence G complex and the Union Trust building. The article says the full renovation will take 5-years, but they plan to start leasing the end of this year, which seems weird. It will be nice to have another 60 units downtown. awesome 🙂 Loved Prov G as my first apt. I love the idea of more units downtown! More density! But, please, please, please… make the units smaller and offer a more competitive price point. The Providence G is grossly overpriced. Their $2,500 per month apartments are laughable. You can probably still see some of them for rent on Craigslist. $2,500 ($30,000 per year, or target market of $120,000 annual income) is far too expensive and I’m not sure who they are appealing to. Certainly not people that plan to make Providence their residence all year long. I’ve been saying for some time on this board that it is so perplexing that developers aren’t turning these perpetually empty office buildings with no hope into residential units for which there is actual demand. Let’s hope this is the beginning of a trend. These 60 units will help us bridge the units coming onto the market in 2017 (Brown apartments, private dorm near JWU, cove2? ), it’s a start, but it’s not enough. Personally, i’d like to see the mayor’s office get involved in promoting and supporting commercial to residential conversions for units downtown. At the end of Mayor Elorza’s tenure, he could be looking at a downtown population twice the current size, a more vibrant pedestrian community (365 days per year), healthier restaurants and shops, larger urban college campuses (and increased enrollment), a downtown ballpark and entertainment district along the river, and most importantly an actual culture that can be promoted by our tourism people. Every time someone mentions converting these commercial properties for cheaper housing, they ignore the cost of converting the property with their head in the sand. That being said, more supply is desperately needed. I don’t know much about the G cost or occupancy, but the overall occupancy rate of Downcity suggest it’s not much of an issue. One imagines that if whatever the G is selling isn’t doing well, that developer isn’t going to build more of the same. If they see demand for the G, this will likely look more like that. More units is what we need for cheaper housing. There’s plenty of housing stock that, frankly as an elitist nowhere near the need for “affordability” in the traditional sense, is incredibly expensive and not worth what you pay all over Providence. Much of the East Side has housing expensive mostly because of location and scarcity for middle and upper middle class housing for those who want to be in Providence. There are many homes on the East Side selling for $400k that should be $250k and would be in other parts of RI. Increasing the supply and an attractive supply that competes with some of that housing will be good for overall affordability. I myself would rather live Downcity where I am now for as long as I stay in RI. But the reality is, if I decide to start a family I’d be silly to not go out of Downcity. That does not have to be the case. They bought the entire building for $4.4 million, right? Excluding the ground level completely operational restaurant (which they will charge rent + NNN), 60 units divided by the purchase price, means the per unit cost before conversion is $73,333. To me, that doesn’t seem like a whole lot of money. They could spend $100,000 in rehab/conversion cost per unit (which is proobably a stretch for a studio), for a total all-in cost of $173,333 per unit, with a 25% equity, 5% commercial loan with readjustment every 5 years for a 20 year term… there debt service is only like $1,038 per month per unit. Seems like there is plenty of room for profit even while charging rents at $1,500 per month for the studio/1 BR units. This is super oversimplifying it, but just making the point that there is no brain surgery here. Even if the return isn’t what it would be in better markets, it’s still better than a long bond or high grade corporate security with not nearly the same risk for an experienced developer. Likely all windows need replacement, all new HVAC, deferred maintenance abounds in downtown buildings, roofs, brick pointing… Upgrades to modern fire systems. Sound-proofing, elevators… I don’t think this particular building has ever been fully vacant so it is probably in better shape than most, but there’s a lot of work to happen before one even considers the apartments themselves. KCB– besides the fact that G does start in that range, as does Westminster Lofts even in Peerless, that building could easily add another 500-750k in windows, $100-200k in elevator costs, tons of costs in plumbing for far more bathrooms and kitchens, and reconstructing HVAC. It’s not just putting up partitioning walls, appliances, and finishes. My own building has 2 commercial units and 24 residential. In the last 5 years we’ve spent close to $200k on boilers + elevator repairs and a new lobby. We are looking at over half a million to replace wood frame windows that are rotting all over. This is a building that’s in relatively good shape and has been more or less fully occupied for at least 15 years. Lucky we don’t need to do pointing or our roof. There’s no reason some units can’t be $1500 or so a month. But it’s also true that many will likely be closer to $2k. 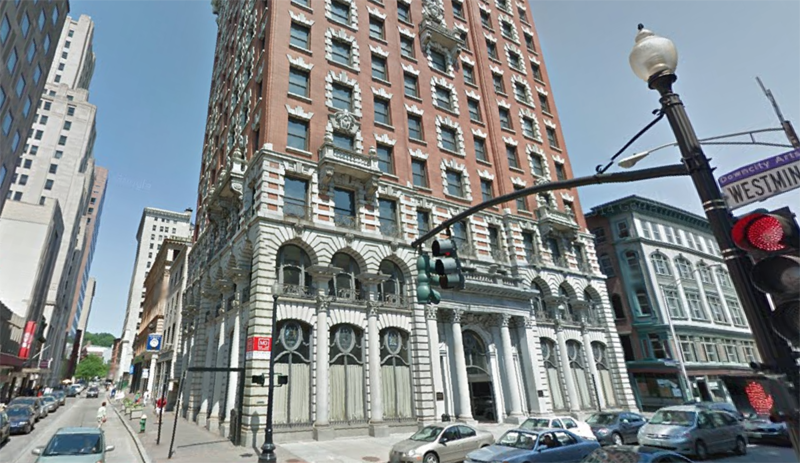 Good info, I was just saying that I think the economics may be there more so than before, if downtown properties such as this one that previously sold for $6.7 million in 2007 are now selling for $4.4 million in 2015. I understand that there is a market for a premium unit at a higher price point, and that’s fine, I just want to see a good chunk of these new projects include units aimed at and priced for people that work and want to live in Providence. I’m not very familiar with the historic tax credit program, does this program support rehab on buildings that are intended to be office units in the downtown area and immediately outside? I would hope not considering the vacancy rate is so high. These monies should go to residential units where the demand really is. I’d like to see a vacancy tax on office space empty for longer than a year. Then roll those funds into supporting downtown development (including office to apartment convestions). Berekely’s proposal was for 50 cents per square foot. This may not raise a huge amount of funds, but it will send a message to people like Paolino that they can’t price above the market value for multiple years at a time. If he is paying $50,000 a year on his empty properties, which are causing downtown to feel like a ghost town, maybe he will lower his asking prices by a few dollars per square foot. Just an idea. I’d be thrilled to tax commercial vacant property, but I don’t think we’re sufficiently supporting folks with things like the HTC to make that fair. But actually my preference would be to do a land value tax which takes care of vacancy (and underutilization more broadly) in a far more fair, transparent, and direct fashion along with other benefits. Great for downtown residential urban density! However… where the hell is everyone working? AND to be able to afford the prices of downtown living in a city with hardly any modern city amenities you’d get at the same cost elsewhere? Oh, right, Ivy League students with wealthy families… Providence is getting priced out of itself. You might be surprised to learn how many residential buildings are moving to eliminate student renters because, they can be problematic, and they don’t need to be renting to them because they have plenty of non-student applicants. I cannot get what I get in Providence for less money virtually anywhere that provides better city amenities and find a job. Providence is not the best job market, but I found one and so did my partner. And what we get for the money makes us very happy we found jobs here. (Although technically I now work for an out of state company and work remotely, we’re staying in PVD for now because we can get more for our buck). Developers will always charge what the market will bear. Currently, $2000 seems to be the going rate and people seem willing to pay it. I am just glad that over the past few years developers seemed to have embraced the rental market instead of “going condo”. Jason, perhaps not for less, but certainly for the same or equivalent amount. With low industry, a poor economy, lackluster transportation, a horrendous infrastructure deficit, high taxes, food deserts in virtually every neighborhood, corrupt government, et al, Providence is widely overpriced. You may be one of the lucky ones, but for the majority of us, I say it ain’t so. Though we have a lot to be grateful for, our beautiful natural landscapes, history and architecture, we still have a long ways to go, and I’d concur that this is only the beginning to seeing out our full potential as a truly livable city worth its cost. And if we’re asking $1600-$2000+ now in 2015, what will the “market” be asking at full build out in 15-20 years? I can count on both hands and feet the amount of people I know who’ve moved from NYC, DC, London, Boston and Vancouver to downtown thinking they’re getting a deal, until they realize all the amenities they lack, not to mention the cost of having a car or groceries delivered, just to move elsewhere. The only pharmacy close to downtown is at the mall and there are no 24/hr conveniences. For a city that seeks to attract millennials and urban-centric dwellers from other cities, not to mention the poor effort in keeping our educated student population post graduation, the costs are overbearing. I get that some properties are no longer renting to students, but again, that can not account for the majority of what I see and hear on the street, and in the neighborhoods where I live and work. I don’t want to be the Debby Downer, however, I believe it is a huge farce that young, non-trustfund, professionals or empty-nesters, the likely target demographic, are flocking to or occupying the majority of downtown residences and at the prices they’re going for. Sure, its a good selling point for marketing and real estate firms to say they have high occupancy rates, but WHO is actually living there makes a difference towards OUR future as well. If we eat up all of our commercial real estate with apartments and condos, again, where is everyone working? From home? The economics just don’t add up for me. As so far the article below, I couldn’t give you more than one or two folks I know who make $72,000, and trust me, I know a. lot. of. people. in Providence. It is shocking to me that I am getting paid Northern Virginia salary (for a non profit but still) and my mortgage is still less than what a 2 bedroom rent will get me in a nice building in Providence. I’d love to move back but at half the salary and twice the housing cost + potholes? No thanks. If few who live downtown come from NYC, DC, London, Boston or Vancouver, who are the people and where are they coming from that don’t seem to flinch at paying $2K+/- per month for rent downtown? If more higher priced rentals are built downtown, wouldn’t that leave the vast majority of housing stock throughout city neighborhoods available for people of lesser means? Rentals (2-bedrooms) – Without being too far away from downtown, other than the East Side, apartments in the Broadway area can be had in the $900 per month range. In Brooklyn rents start roughly at $2,800/month, in Manhattan $3,700, and in Boston the range is $1,600 to $2,800. Houses – Providence (not the East Side and not burnouts or vandalized) general range $50K – $260K, Brooklyn (not necessarily close in or near trains) $400K – $1.2M. Flying Weasle, then you’re talking about a 2 hour commute plus $400/month for transportation. Working remotely fixes that, but most people can’t do that. It works for some people, but do you really think we could get high density with everyone working in boston or remotely? Do we really want downtown to be boston neighborhood? A 2 hour commute at minimum. I’m just explaining why there’s a demand for more downtown apartment units. You’d be surprised at how many Rhode Islanders work in Boston. Has anyone quantified the total amount of residential units coming online before 2017? 736 new downtown residential units, let’s hope that some of these are priced reasonably, or we will have quite the excess. I’m willing to bet that these get absorbed without any problems. For the most part, these are all “downtown”, or close enough where the density increases will be visible. At what point does downtown deserve a grocery market? If there are roughly 5,000 downtown residents now, and we are on pace to be closer to 7,000 by the end of 2017, which is an accomplishment, albeit pretty far from where we need to be — it’s still a 40% increase over 2-3 years, and over 50% increase when we include the development over the last 12-18 months (Arcade, G, etc.). All these projects individually are not “game changer” developments, which is fine, but together they are meaningful. Based on previous economic impact studies I have seen, and the price point of these units as announced, it’s not outrageous to get to a $15 million direct economic impact number for downtown Providence. It’s a lot of money for a small downtown, especially if that is spread over a small amount of businesses (top 20% restaurants, pharmacy, groceries, entertainment, retail). Seeing that the resources have been there to plan, stage construction, and in some case commence construction — is great to see. We can handle it. What’s discouraging is that we still don’t have a publicly declared goal by the administration to move people in downtown; not just an empty statement, but a quantifiable goal with an actual number that they want to achieve annually. If they are not balancing the budget, they need more revenues, how are they going to achieve it? Move more people into the City! In the short term who cares about the first couple years of property taxes, let the developer keep it if they complete their projects on time. This may attract more experienced developers. This is a long-term vision that we should be worried about. We are about to move 2,000 more people downtown in less than 3 years, we can repeat that and add another 4-5,000 downtown over the balance of a decade’s time. It can be done. 1. Higher frequency of MBTA trains to the airport and South County, and Express service from Providence to South Station. Potentially adding station stops in Pawtucket, EG, and Westerly. 2. Dedicated bike lanes throughout the City. 3. Pedestrian-only streets, once density has been achieved. 4. Basic services for downtown residents, like pharmacy, urgent care, grocery store, etc. 5. Modern streetcar linking the train station to city college campuses and the hospital. Who knows, a downtown that size (and dense), together with a more equitable tax plan for the colleges could result in seeing some of the big ideas that have been suggested actually come to fruition. Read: Broadway Gate, Westminster Crossings. The City could actually support projects like that, at that point. But, it starts with a gameplan and we still haven’t heard one from Elorza. All we’ve heard is that he is increasing fees and license costs on businesses. Tell us the City is actively courting residential and mixed use developers to add density to the City and improve the tax base, show us that you get it. Oops, sorry folks, I left out the Union Trust numbers from those guestimates. Apologies. Just realizing how the future of working from home could make PVD a realistic place to live for NY and Boston workers. The trend of out of the office jobs will only increase as the years go on. I’ve lived in Downcity for 5 years. Started out as a state employee, then Brown University, and now working from home + traveling a lot for an out of state company. KCB– I’ve repeated on this page many times that I think that the real economic development strategy for Providence is 20,000 in 20 years. We should have 20k residents from the State House to Point Street, from Memorial Boulevard to 95 by the 2030 census. That would represent 2^3 growth from 2000… doubling 2000-2010, 2010-2020, 2020-2030. It is an incredibly reasonable goal *with good planning*, and would transform this city from a slightly sleepy area dependent on commuters into a vibrant, self-sustaining community of residents. It totally changes the calculus on ridership for any transit improvements that will undoubtedly go through the city core, changes dramatically the type of businesses that can succeed here, and will change dramatically the revenue picture for the city (and state). I think we can probably get to 10k with little additional direct investment and little concerns about affordability, and 20k is achievable with a better mix both up-market (in terms of space for families) and down market (affordability largely through more 500-800 square foot units, intentionally making it easier to build for less cost, and no massive tax penalty for rental units) and investments in transit. And I share Peter’s point that “If more higher priced rentals are built downtown, wouldn’t that leave the vast majority of housing stock throughout city neighborhoods available for people of lesser means?”. There is tons of housing stock that is not particular high quality rented or sold for far too much money. At least some of this is due to the inability to meet the demand for mid to up-market housing in the Downcity core. If you’re not happy about gentrification of Fox Point, the West End, or Summit/Mt. Hope, to the extent that these patterns exist, you can hardly be against providing more housing supply in the price range of those new entrants that are driving up rents in those neighborhoods. 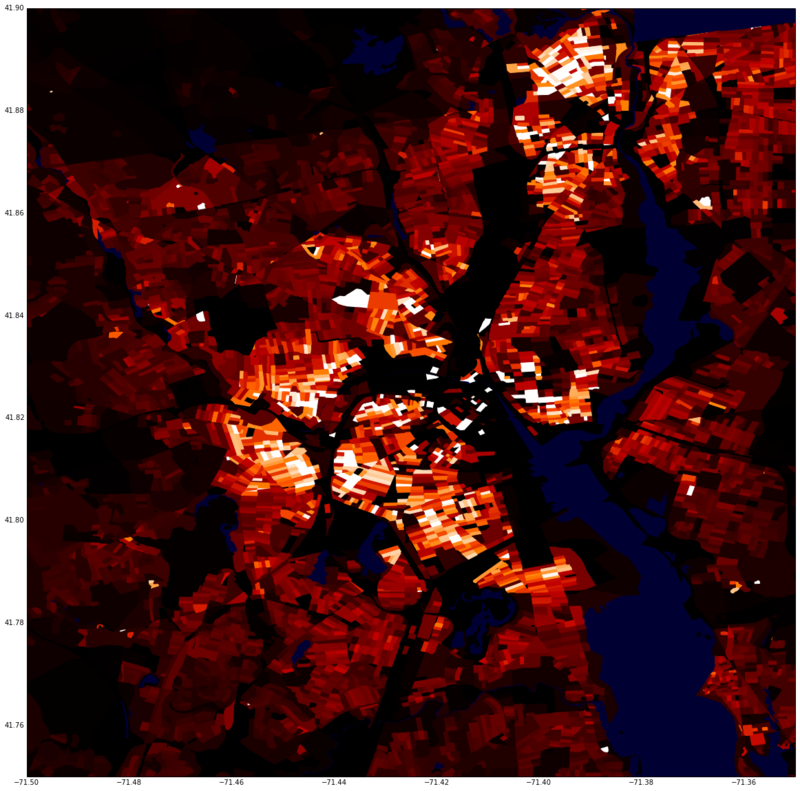 Jason, I think this picture of population density from 2010 is the best argument that 20k people downtown is realistic: http://i.imgur.com/oDyJVSZ.png . How can nobody see this?!?! Its infuriating and quite frankly… insulting to the people who try to make this city anything but a G*d damn college campus! Jef said that downtown residential property owners (he works for one) are getting rid of students. That Flying Weasel said that you’d be surprised at how many Rhode Islanders work in Boston. If you are assuming that I’m advocating for students, I am not. For decades Providence has had 40,000+/- college students and today it still has 40,000+/- students. The numbers haven’t changed much. Why does expensive downtown rental housing equate to making the city a “G*d damn college campus! Michael: Indeed, without the colleges we are Fall River, not that’s there’s anything wrong with that (oh my Maude, there is so much wrong with that!). There are a few neighborhoods in Providence that are rarely (If at all) see the benefits of students in Providence, but they sure are effected by the lack of taxes contributed by the Institutions and their exempt status. I think Jason is right on the money with his 20K by 2030 goal. On the chicken/egg question of jobs versus people, there is clearly a much greater demand for housing downtown than for office space. Filling downtown with residents should be one of our top civic priorities. There should be apartment buildings rising from every vacant parcel within a 15 minute walk of the train station. Peter Brassard, you’re wrong about the student population, the enrollment at the local colleges has greatly expanded over the past 20-30 years, especially at JWU, PC, and RIC. Boyd, touché, but over the last decade and a half the increase hasn’t been quite as dramatic as earlier. Since the city economy is so dependent on the universities, why are students considered by some to be a detriment? A high student population has worked out well for Boston and Cambridge. Besides the additional dorms that the schools recently built, if developers construct buildings geared for student occupancy, such as the Thayer Street building and the Parcel 28 proposal, wouldn’t more housing be available downtown and in other sections of the city for the general population? There’s a demonstrated need for professionally managed, ‘upscale’ student housing. It would help to populate the jewelry district and, as you said, relieve pressure on the neighborhoods. People have a negative view of ‘student housing’ because they picture college ghettos of shabby tenement apartments like you see near PC, Federal Hill, and in Fox Point with broken glass, red solo cups, and moldy, flammable porch furniture. Students add immeasurably to the life of a city and we should definitely be encouraging as many of them to live downtown as possible.